The fewest mail deliveries take place on Saturdays, a day when more than a third of U.S. businesses are closed. Washington (CNN) -- Neither snow nor rain nor heat nor gloom of night may stay the nation's letter carriers from the swift completion of their appointed rounds, but e-mail and the recession may stop their Saturday deliveries. Under a plan to be delivered Tuesday to its regulator, the U.S. Postal Service announced Monday it would cut Saturday delivery beginning in the first half of next year. "If the Postal Service takes no action, it could face a cumulative $238 billion shortfall by the year 2020," the service said in plans given to reporters. The Postal Service said the cutback would save about $3.1 billion in the first year and as much as $5.2 billion per year by 2020; the Postal Regulatory Commission estimated annual savings of $1.9 billion. Saturday delivery was selected for elimination because that is the lightest-volume delivery day of the week and a day when more than a third of U.S. businesses are closed. Still, Express Mail deliveries would continue and post offices that are open Saturdays would remain so, the Postal Service said. Congress would have to approve any change, and six months notice would be given before any move being made, it said. Mail volume has dropped from a peak of 213 billion pieces in 2006 to 177 billion last year, and volume is predicted to continue to fall, the Postal Service said. 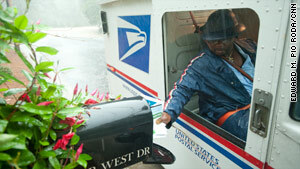 "Quite simply, there is much less mail to be delivered, yet costs to deliver the mail continue to rise," it said.